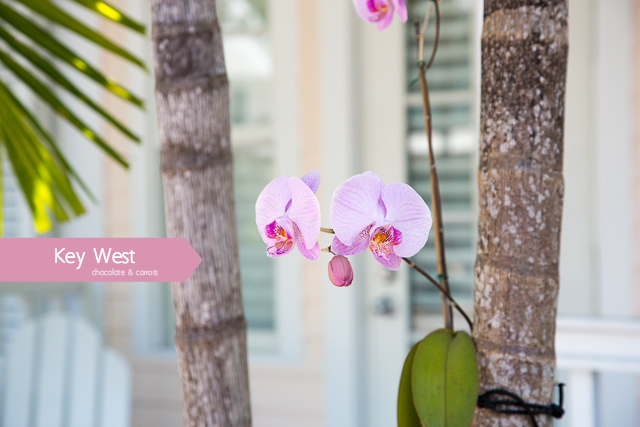 For our third and final day in the Florida Keys, we drove one hour from Tranquility Bay Beach Resort to Key West, with the BOB stroller in tow (necessity on the bumpy sidewalks of Key West). 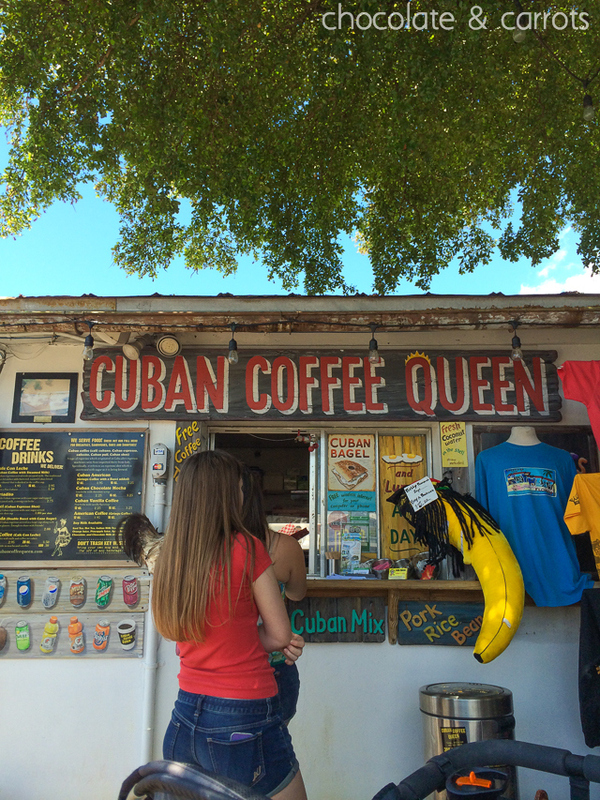 We parked in one of the many public parking lots throughout the city and walked right across the street to the Cuban Coffee Queen for some lunch on-the-go. 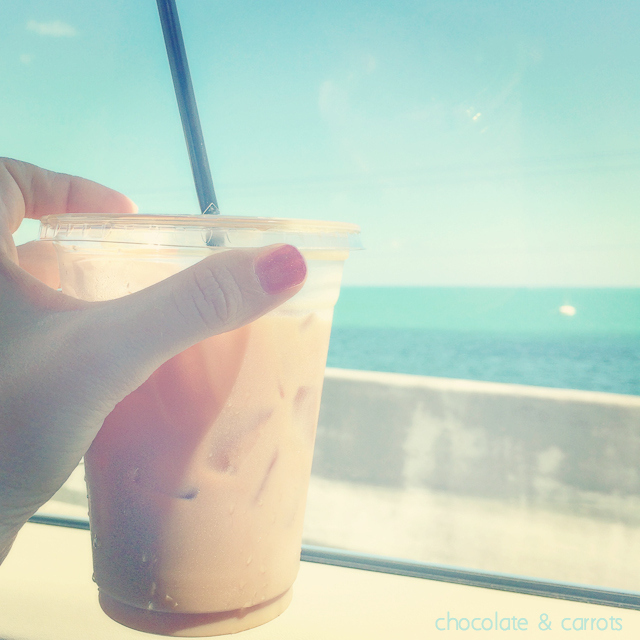 The Cuban Coffee Queen was recommended to us and received good reviews online, so we gave it a try! 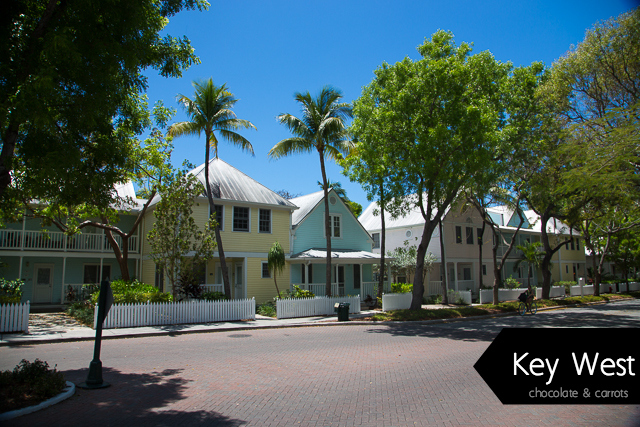 It’s a purely take-out restaurant and coffee shop, making for a fun atmosphere in the laid back lifestyle of the Keys. 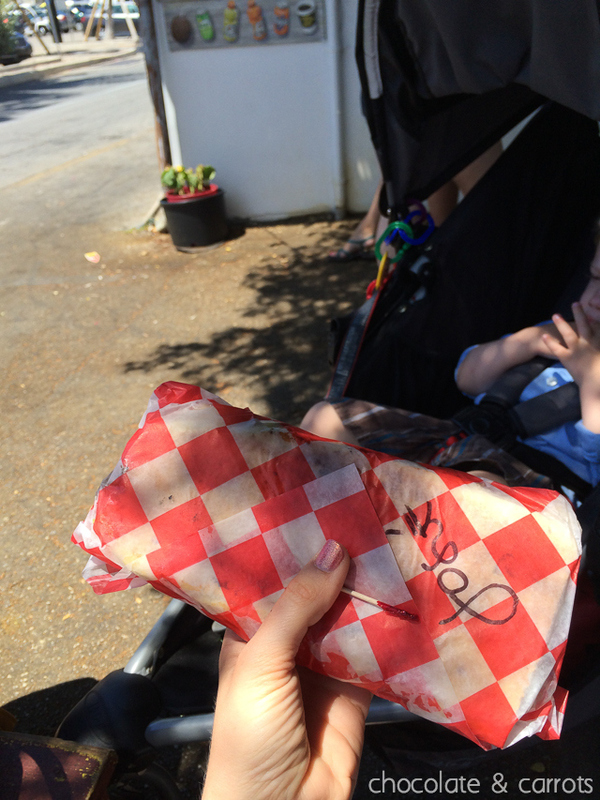 I got the Jose Marti sandwich and my husband got the Cuban Mix sandwich. Both were delicious, but they were HUGE! 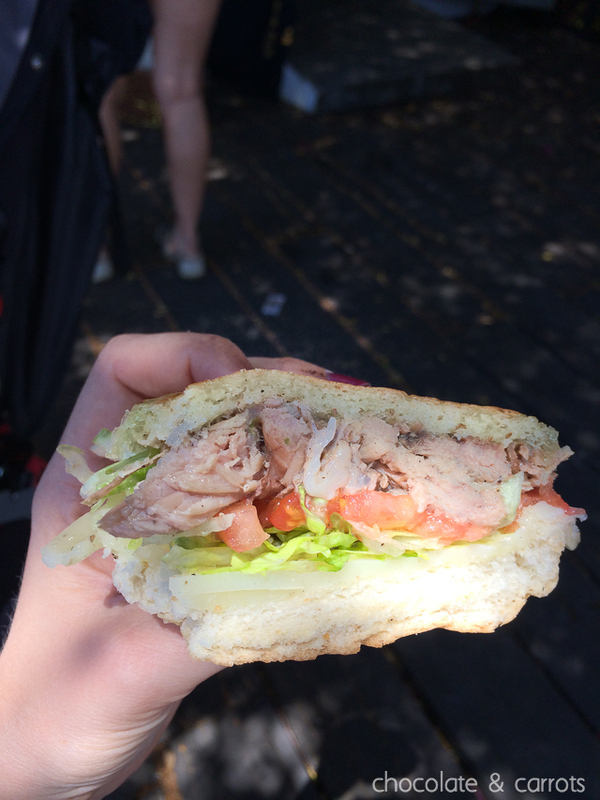 We could have totally split one sandwich. We also ordered a fruit smoothie, which was also delicious. 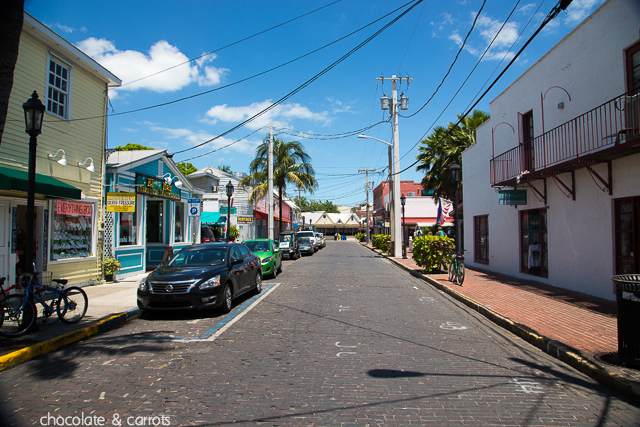 After our bellies were full, we set out in the blistering heat to walk around and explore Key West. 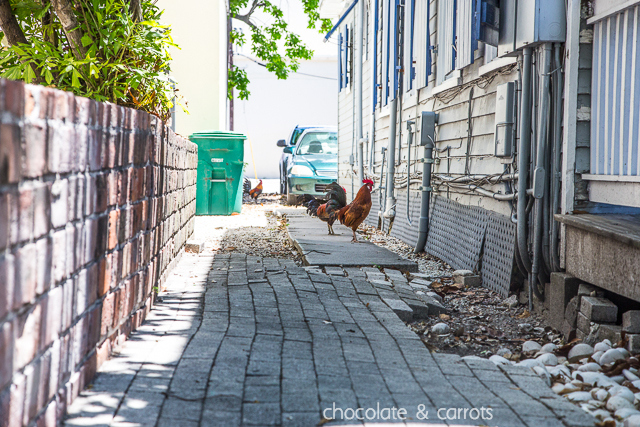 We came across many chickens, chicks and roosters along the way. 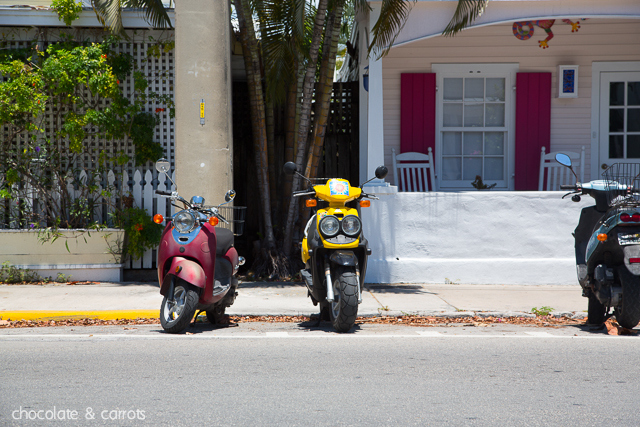 We were also pleasantly surprised at how many mopeds and bicycles there were on Key West. I guess it only makes sense when the island is only 7 square miles. 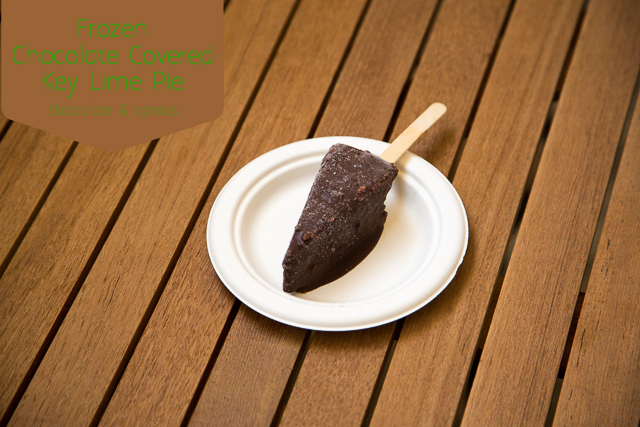 After walking for a bit, we stopped in at the Key Lime Pie Company to get a Frozen Chocolate Covered Key Lime Pie…on a stick. I was skeptical at first, but it was amazing! Even Liam loved it! 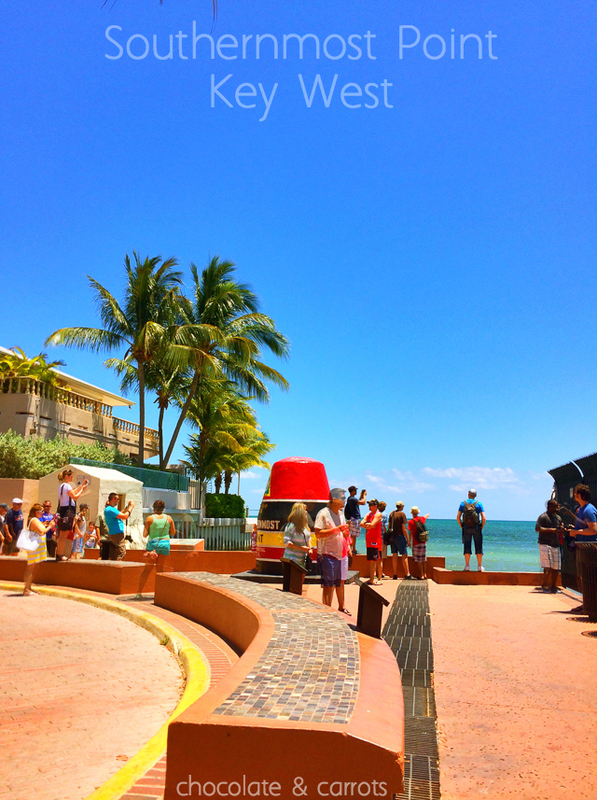 Of course we had to go to the obligatory destination in Key West, the Southernmost Point in the continental US. You wouldn’t believe how long the line was to take a photo at the point. 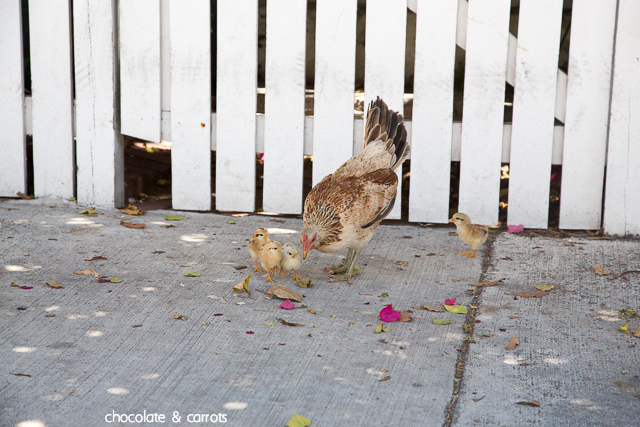 We just hung back in the shade and snapped our photo. And is it just me, or is the Southernmost Point not really the true southernmost point? 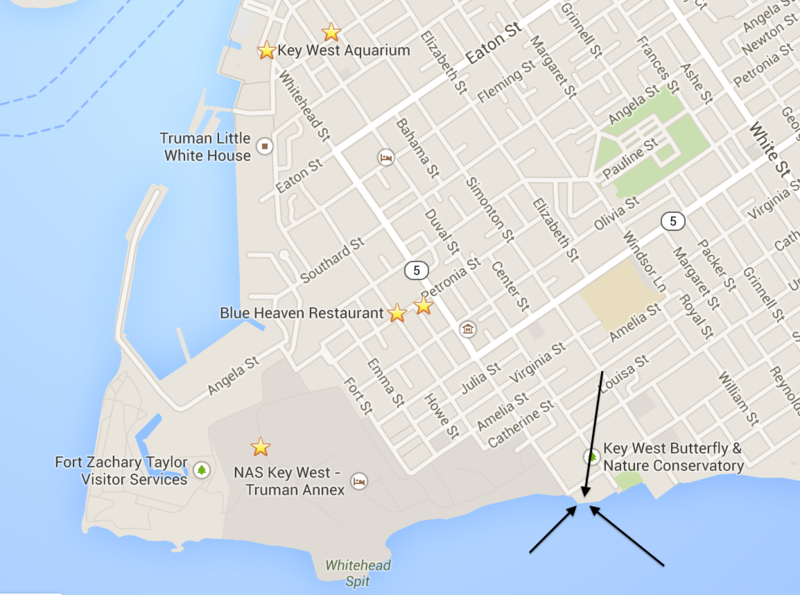 I do believe it lies within the military base just west of the Southernmost Point. (See map below) Just thought I would point that out. 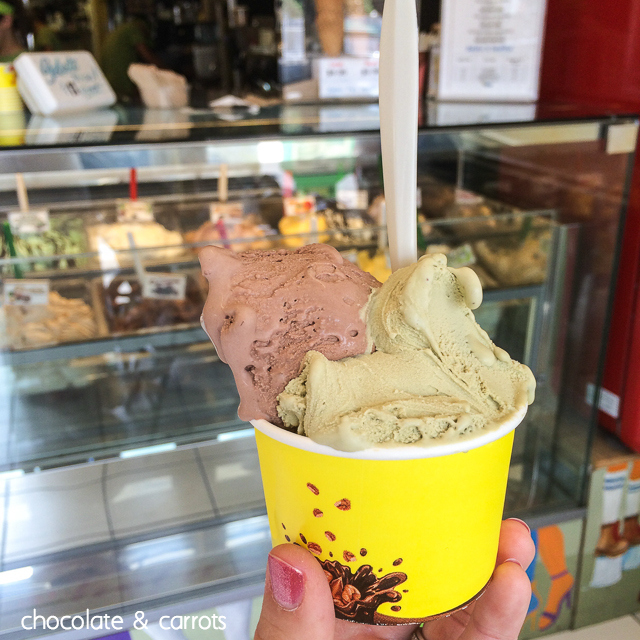 After quite a bit of more walking (and sweating), we stopped in at Duetto Pizza & Gelato. We ordered the most creamiest gelato I’ve ever had. It was delicious and the perfect treat to cool us down again. I got nutella and pistachio. Delicious! 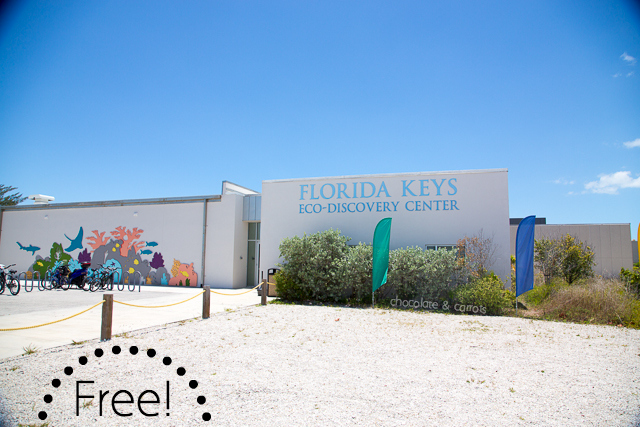 The Florida Keys Eco-Discovery Center is a free way to become educated on the wildlife of the Florida Keys. There’s a movie screen, interactive exhibits and a small aquarium inside. 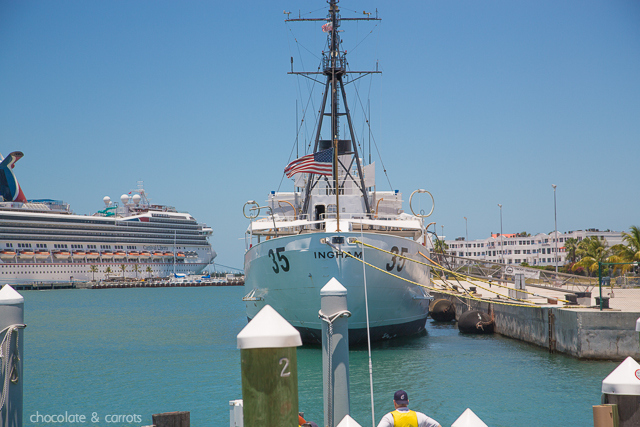 It also sits right next to the port where you can view all of the cruise ships and naval ships. 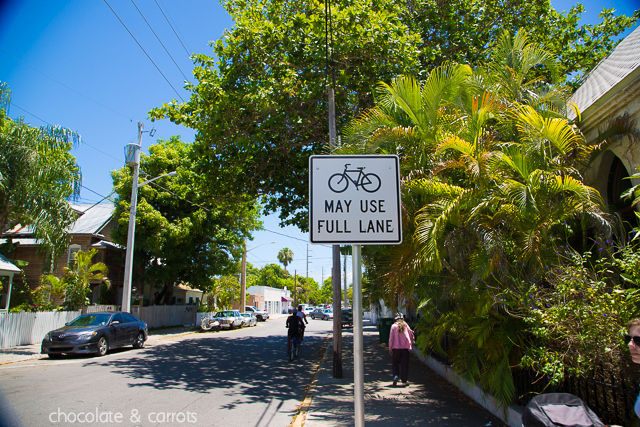 We had fun wandering around Key West. I don’t know if I’d ever go and stay there, but it was nice to visit for a couple of hours. 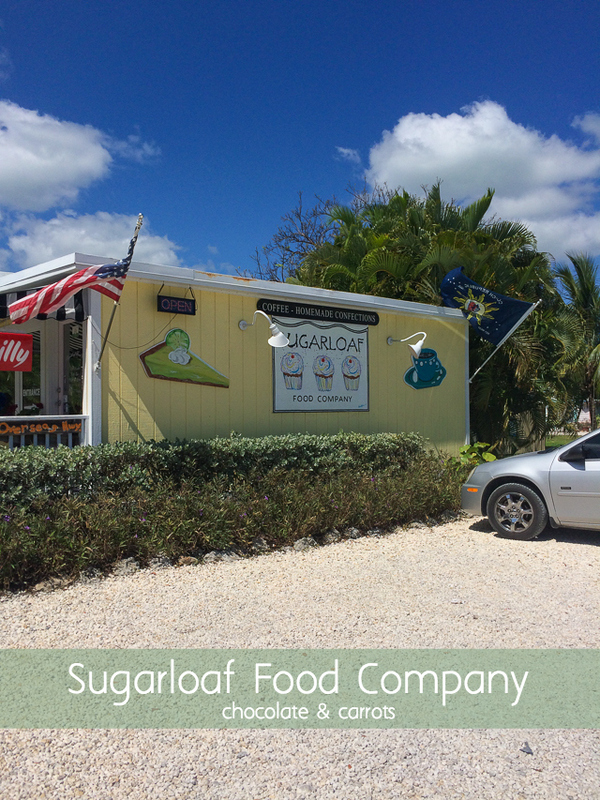 On our way back we stopped at Sugarloaf Food Company to get re-fueled. 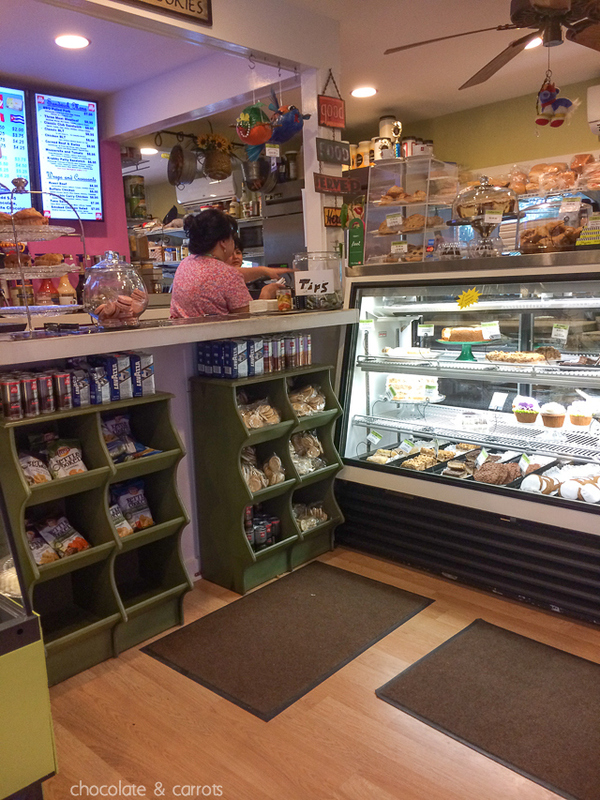 They have everything from coffee to pastries to food. It’d be a great place to order a take out to bring to the beach! Stay tuned for tomorrow’s post about the last leg of our journey! This post contains an affiliate link where a small percentage of purchases goes toward supporting my site. Hey Caroline, I have a question . 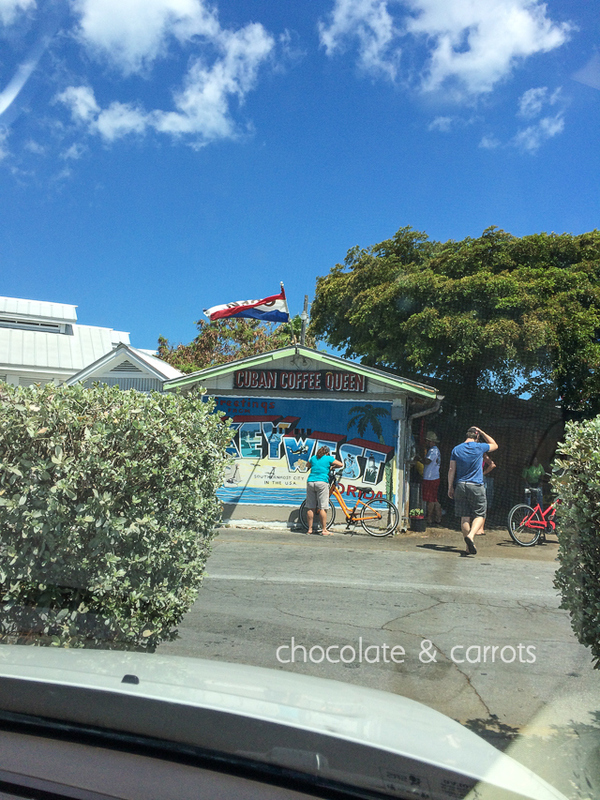 Who is that girl standing up right in front of the Cuban coffee queen place with a red top and shorts? Is it you?